An almost weekly assortment of musical oddities purchased by or given to POF. Everything labeled (?) is avail through a hearty google search. ANCESTORS/GRAVEYARD – Split 7” (volcom) – Final of six 7”s released for Volcom’s 2009 subscription series. Limited to 1000 copies on sea-foam green vinyl. BEST COAST – When I’m With You 7” (black iris) – Ex-Pocahaunted; Fifth release from Black Iris Collective. Download a mp3 of the A-Side HERE. BLACK MOTH SUPER RAINBOW/OCTOPUS PROJECT – The House of Apples and Eyeballs 12” (graveface) – Blue vinyl limited to a run of 1,500. The GATES Of SLUMBER – Hymns of Blood and Thunder (?) – A mightily ‘thunderous’ release from Indianapolis doom metal veterans, who are playing at the Double-Wide May 20th. MP3 of “Iron Hammer“. The HOSPITALS – S/T (in the red) – 2003 reissue? by Portland guitar and drum Garage duo. NICK OLIVERI – Death Acoustic (impedance) – Ten heavy-handed acoustic songs from notorious ex-bassist of Queens of the Stone age; yet built his own following as Rex Everything in the Dwarves and as the front man of Mondo Generator. Death Acoustic includes a cover of the Misfits “Hybrid Moments”, a Moistboyz (ween) track “U Blow”, Brant Bjork’s “Love has Passed Me by” and “I’m Gonna Leave You”, which Oliveri penned with Josh Homme for the Queens of the Stone Age album Songs for the Deaf (interscope). Playing at Double Wide on February 21st. SIR SILKY – Perilous Hits (self) – Perilous Hits is the debut EP from local musical savant who seems to sinisterly conjure up a cross between a boogie-down version of White Stripes with the confident sexual sleaze and antics of Har Mar Superstar. SISTERS – 1st EP (death by audio) – Debut release from guitar pedal creators and Williamsburg venue/studio/collective: Death By Audio. Sisters are a guitar/vocal and drum duo who create raucous garage pop, shamelessly inspired by 90’s rock pop. Hand numbered and screened sleeve. Recorded by Oliver Ackerman of A Place to Bury Strangers. The SOFT PACK – EP 12″ (kemado) – Four song teaser for their upcoming full length that drops in February. THOSE DARLINS – Those Darlins (oh wow dang!) – Charming alt. country; fantastic production on this album. Playing at Doublewide for Bro Fest 2010 on March 21st, details coming in a few days. 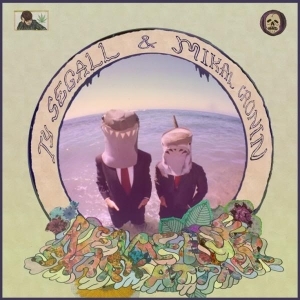 TY SEGALL & MIKAL CRONIN – Reverse Shark Attack 12” (kill shaman) – Info from Kill Shaman: TySegall (Sic Alps, Epsilons) and Mikal Cronin (Okie Dokie, Charlie and the Moonhearts) bust out a 10-track delight of psychedelic garage jams that is sure to please the most scrutinizing rocker. Equal parts danceable garage rock and effects-ridden psychedelica, “Reverse Shark Attack” is a mind-blowing explosion of loud guitars, pounding rhythms and signature vocal harmonies. Ty and Mikal balance perfectly between Soprano and Baritone vocals, making for an outstanding listening experience. The B-side is a single 10 minute Beatles-esque medley that starts off weird, gets mellow and folky, then explodes into a Ventures-induced headache of smashed drums and wildly vibrant surf guitars. Definitely a winner, and nothing like either of their projects have done before. WIRES ON FIRE – Annie Carr/Mask 7” (psychedelic judaism) – Limited to a run of 500 copies (100 oxblood/400 translucent green). This came out in August 2008, but I never knew about it till the other day. This entry was posted on January 1, 2010 at 10:10 am, filed under News and tagged Recently Acquired.